We think that the initial data set had around 30 variables, but for some reason I only have the 13 dimensional version. We had a list of what the 30 or so variables were, but a.) we lost it, and b. ), we would not know which 13 variables are included in the set. The evaluation of this dataset is done using Area Under the ROC curve (AUC). An example of its application are ROC curves. Here, the true positive rates are plotted against false positive rates. An example is below. The closer AUC for a model comes to 1, the better it is. So models with higher AUCs are preferred over those with lower AUCs. Please note, there are also other methods than ROC curves but they are also related to the true positive and false positive rates, e. g. precision-recall, F1-Score or Lorenz curves. AUC is used most of the time to mean AUROC, AUC is ambiguous (could be any curve) while AUROC is not. The expectation that a uniformly drawn random positive is ranked before a uniformly drawn random negative. The expected proportion of positives ranked before a uniformly drawn random negative. The expected true positive rate if the ranking is split just before a uniformly drawn random negative. The expected proportion of negatives ranked after a uniformly drawn random positive. The expected false positive rate if the ranking is split just after a uniformly drawn random positive. Assume we have a probabilistic, binary classifier such as logistic regression. We predict 0 while we should have the class is actually 0: this is called a True Negative, i.e. we correctly predict that the class is negative (0). For example, an antivirus did not detect a harmless file as a virus . We predict 0 while we should have the class is actually 1: this is called a False Negative, i.e. we incorrectly predict that the class is negative (0). For example, an antivirus failed to detect a virus. We predict 1 while we should have the class is actually 0: this is called a False Positive, i.e. we incorrectly predict that the class is positive (1). For example, an antivirus considered a harmless file to be a virus. We predict 1 while we should have the class is actually 1: this is called a True Positive, i.e. we correctly predict that the class is positive (1). For example, an antivirus rightfully detected a virus. In this example of a confusion matrix, among the 50 data points that are classified, 45 are correctly classified and the 5 are misclassified. True positive rate (TPR), aka. sensitivity, hit rate, and recall, which is defined as TPTP+FNTPTP+FN. Intuitively this metric corresponds to the proportion of positive data points that are correctly considered as positive, with respect to all positive data points. In other words, the higher TPR, the fewer positive data points we will miss. 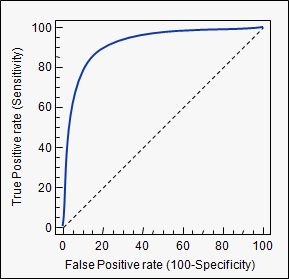 False positive rate (FPR), aka. fall-out, which is defined as FPFP+TNFPFP+TN. Intuitively this metric corresponds to the proportion of negative data points that are mistakenly considered as positive, with respect to all negative data points. In other words, the higher FPR, the more negative data points we will missclassified. To combine the FPR and the TPR into one single metric, we first compute the two former metrics with many different threshold (for example 0.00;0.01,0.02,…,1.000.00;0.01,0.02,…,1.00) for the logistic regression, then plot them on a single graph, with the FPR values on the abscissa and the TPR values on the ordinate. The resulting curve is called ROC curve, and the metric we consider is the AUC of this curve, which we call AUROC. 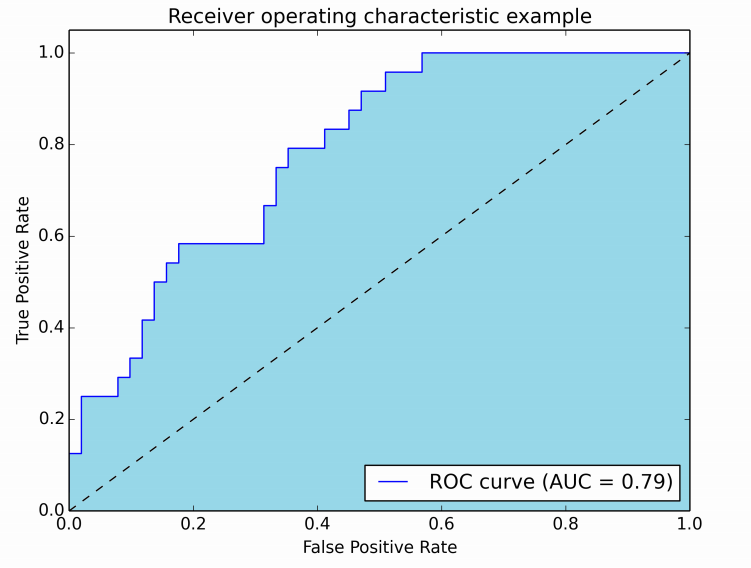 In this figure, the blue area corresponds to the Area Under the curve of the Receiver Operating Characteristic (AUROC). The dashed line in the diagonal we present the ROC curve of a random predictor: it has an AUROC of 0.5. The random predictor is commonly used as a baseline to see whether the model is useful. You cannot sign up from multiple accounts and therefore you cannot submit from multiple accounts. Privately sharing code or data outside of teams is not permitted. It's okay to share code if made available to all participants on the forums. You may submit a maximum of 5 entries per day. You may select up to 2 final submissions for judging. Use of external data is not permitted. This includes use of pre-trained models. Hand-labeling is allowed on the training dataset only. Hand-labeling is not permitted on test data and will be grounds for disqualification. 1 super 0.51948052 1 Dec. 30, 2018, 5:28 p.m.
At Arithmetica we value math and data. We provide an ability to practice and learn datascience.